New Hampshire Landlord Insurance Quotes - Get New Hampshire Landlord Insurance Quotes in Minutes. New Hampshire landlord insurance quotes can save you hundreds of dollars a year on the coverage of your investment property. This coverage can include damage and destruction, as well as other potential dangers that owners of rental properties often face. You can buy landlord insurance for your properties in Concord, Derry, Dover, Keene, Laconia, Manchester, Nashua, Portsmouth, Rochester, or any other town of any size in New Hampshire. No matter where your property is, you have many options for keeping your investment protected. Our New Hampshire landlord insurance quotes form will help you find the best prices for the coverage you need, but first you might consider a few different types of coverage. Potential property damage and destruction is the main reason landlords need insurance for their rental units. Smoke damage, water damage and fires are usually covered by most landlord insurance policies. New Hampshire winters can also damage properties, as can coastal storms. Make sure you will have protection for damage from ice dams, fallen trees and broken pipes. All landlords need to assess their particular insurance needs based on their property type, location and finances. 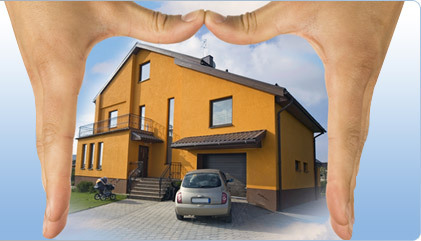 You can compare New Hampshire landlord insurance quotes using the form found here on this website. Most investment property owners who use it save money because our quotes come from our network of about 200 insurance companies that offer investment property coverage. This means we can deliver a variety of insurance options and at extremely competitive prices. Flooding is an all-too-common form of property damage, and unfortunately, it isn't covered by default by landlord insurance policies. Melting snow and ice, heavy rains and coastal storms can all cause flooding, and southern New Hampshire is especially prone to this problem. Because flood damage is a major gap in insurance coverage for many landlords, be sure you add this to your policy. It is much better to pay a little more for it today and never need it, than to need it at some point and find out flood damage isn't included in your landlord insurance policy. It could save you from having to pay for thousands of dollars in repairs yourself. Whatever you do, don't wait till you hear weather reports that a storm is coming to order flood protection. There is a waiting period before flood insurance becomes active, so you would still be responsible for covering any expenses from flooding until then. Many investment property owners in New Hampshire consider insurance for loss of rental income. This type of coverage pays landlords when tenants have to move out because damage to the building makes it impossible to continue living there. When a unit can't be rented during repairs, this can help a landlord continue to pay bills. Some New Hampshire landlords may want to consider buying contents insurance for the things they own within their rental units. These contents would include such things as furniture they provide to tenants, and also appliances. (Refrigerators are an example.) Tenant possessions are not included in this type of policy, so landlords should recommend or even require that their tenants have separate renter's insurance policies. Coverage for liability and legal fees is another factor to consider when comparing insurance policies. Accidents happen, and if someone is hurt on your property, you may have to pay medical expenses or other damages. And if attorneys or courts get involved, legal fees can also pile up. Be sure to include adequate coverage for legal fees and liability when shopping for a landlord insurance policy. Accidental damage caused by tenants can also be included in New Hampshire landlord insurance quotes. This can be helpful to landlords when renters cause more damage than their damage deposit will cover. As mentioned above, the most common mistake landlords make when buying New Hampshire investment property insurance is not having flood protection. But there are two others: having too big a deductible and not insuring replacement value. You can certainly save money on your insurance premiums by choosing a higher deductible. This means you would have to pay more out of your own funds before insurance kicked in. Though this can be tempting, it can also be a real problem if you don't actually have the necessary funds available. So make sure your deductible is something you could actually afford to pay should something happen. And finally, many landlords make the mistake of insuring their properties for cash value rather than what it would cost to replace the property should it be destroyed. Usually cash value pays much less than replacement cost. Though paying for landlord insurance that would pay you to completely rebuild costs a bit more, it is the best protection you can get for your investment. New Hampshire Landlord Insurance Quotes Are Fast, Easy and Free! Get New Hampshire landlord insurance quotes today by filling out the request form on this site! It only takes a couple of minutes, and you could receive big savings on your landlord insurance premium. There's no obligation, so don't put it off – fill in your information now.